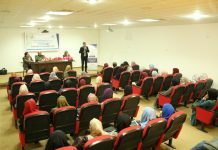 In Al Sadda Land Resort, the National Society for Democracy and Law (NSDL) conducted a study day entitled Legal Protection for Women in System of the Personal Status Law”. This study day was held in the presence of Dr.Haifa Al Agha ,Minister of Women’s Affairs, Heba Murtaga. The Coordinator of Civil Society Sector in Promoting the Rule of Law, Dr. Mohammed Matter, University Lecturer, Zeinab Al ghanimi , the director of center for the researches and legal consultations, Mona Al Shawa, the director of women’s right unit in the Palestinian Center for Human Rights) , Rafat Al Holli(an enforcement officer at Sharia court in Khan Younis) and Dr. Ibrahim Moamar (chairman). 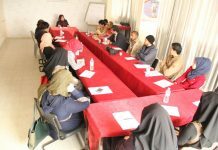 As well as, 77 of the legal and media personae, youth activists and civil societies representative from both genders attended the study day. The study day divided into two sessions. Three working papers were discussed in the second session. Dr. Mohammed Matter, the facilitator, opened the study day welcoming the guests in the first session and he emphasized on the important of the study day due to the sensitive issues it tackles. Then, Dr. Ibrahim Moamar, the chairman, talked about the role of NSDL on providing legal services to vulnerable groups especially women. 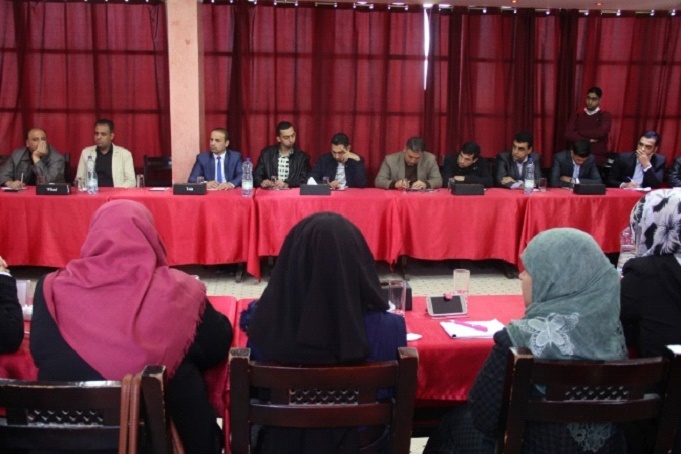 Dr. Moamer also pointed out the important of giving women’s their complete dignity, stopping all forms of discrimination against them and the need of harmonization the local law with international treaties and conventions. Moreover, Dr. Haifa Al Agha, the Minister of Women’s Affairs, talked about the important of working with all possible ways to stop the discrimination and persecution against women for women and to provide women with their rights and dignity in honor to their great sacrifices. She noted that the violence against women is an international phenomenon, it is not just in Palestine but the situation is the worst in Palestine as a result of the occupation actions that targeted the women as men. In addition, she emphasized that her Ministry was working to execute some amendments on the personal status law to guarantee the protection of family in general, and women in particular from violence and discrimination. She also spoke about some of laws which are currently in progress to change in particular what’s called with “mitigating excuse” in the Penal Code so it is necessary to harmonize Palestinian legislation with international treaties and conventions. 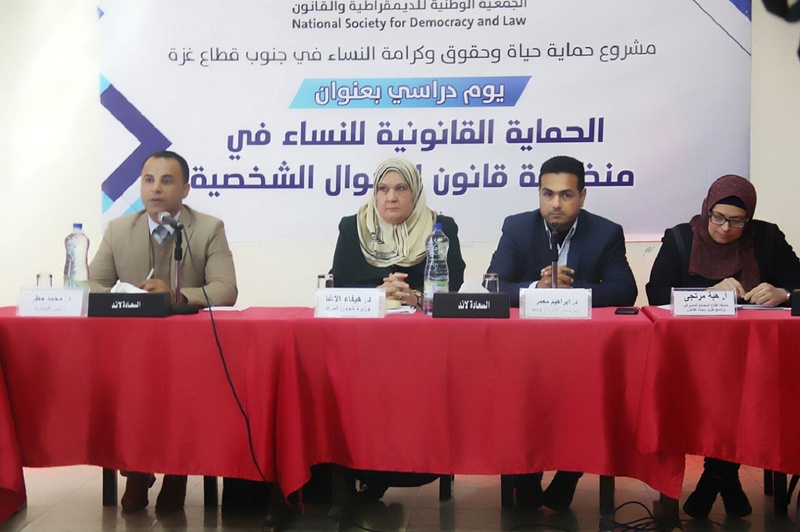 Heba Murtaga, the Coordinator of Civil Society Sector in promoting the Rule of Law at UNDP, emphasized the role of the legal awareness and legal representation of women through 30 partner institutions with numerous of Legal Aid Clinic distributed in all areas of Gaza Strip. She stressed on the need to focus on issues of gender-based violence and there are ongoing efforts in order to raise awareness of women legally to guarantee their seeking to claim their rights. During the second session, Mona Al Shawa emphasized in her intervention that there is a division in law. The applicable Personal Status Law in West Bank is Jordanian and the applicable Personal Status Law in Gaza is Egyptian so this law distinguished between the woman and the man in divorce, marriage, guardianship and witness. This law must be amended through the first and the second legislature councils. Unfortunately, that was not to be. She pointed out that there has been some progress due to the efforts of women and the NGOs but there’s a lot haven’t achieved and it has to be continuing to fight in order to change disadvantageous law against women. 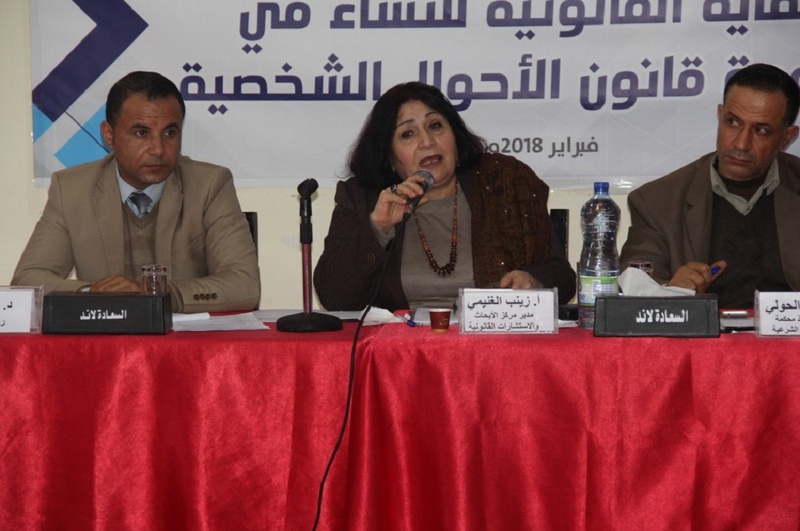 Zeinab Al ghanimi, the director of center for the researches and legal consultations, emphasized that discrimination is considered the most aggressive kind of violence against women. She criticized the applicable of Personal Status Law in Gaza because it discriminates between man and woman and its inadequacy to bring justice to women. The law hadn’t given definition of the concept of marriage. She also talked about the family violence as one of the form of gender-based violence, which stated on misconception inherited on male guardianship on women. This gives some men high authority for controlling women that has caused so much violence and injustice on women. She declared about the misconception of the dowry. It is interpreted by some men as price to pay for women enslavement but its meaning in Islam and law is completely different. Rafat Al Holli, an enforcement officer at Sharia court in Khan Younis, provided an intervention. He emphasized on the difficulties and obstacles of execution of some judicial provisions because of inadequacy of some law and the opponent manipulation. 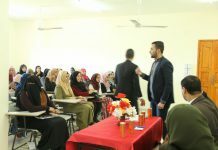 He indicated that he presented a research study included suggestions to execute several amendments on provisions of law and to ensure giving women their rights and stopping manipulation from some men towards preventing the implementation of the resolutions and provisions issued by the court. 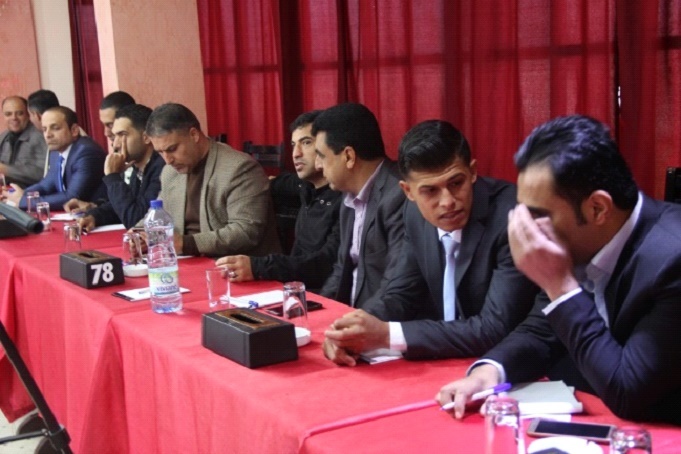 The meeting included several interventions from the attendance. Mr. Sami Barhoom pointed out that the problem was represented in the customs, traditions and values that devoted the discrimination and injustice against the woman and some laws devoted the discrimination. Therefore, the required from all is more campaigns, programs, training and conferences, because these activities have succeeded in a real breakthrough those disadvantageous customs and traditions against woman. 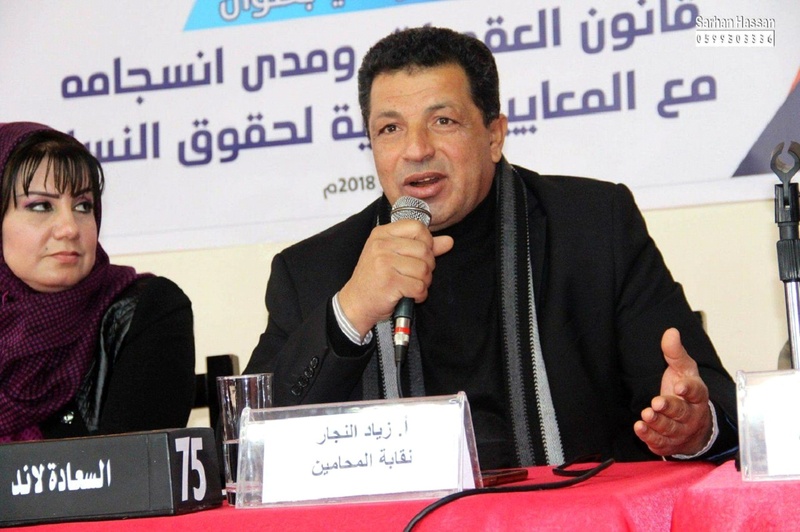 Furthermore, Suliman Al Shawi, the activist of the field of the disabled persons, talked about we have to support the rights of women with disabilities because they are the poorest and the most vulnerable. Moreover, the discrimination is clear against them. 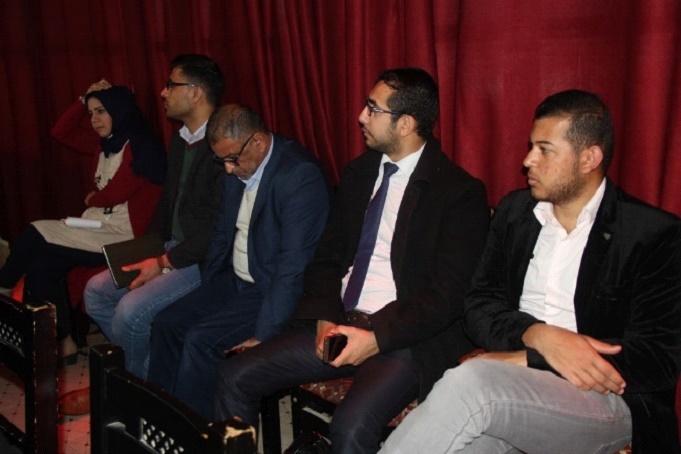 The lawyer, Mahmoud Waif, stressed during his speech that we should not justify any discrimination practices against women and we need unified vision for all women’s and human rights institutions to work in an integrated manner. 1- The necessity of working on the harmonization between the internal law and the international conventions and treaties that Palestine has recently joined. 2- The necessity of Unified Strategic Agreement between all women’s and human rights institutions to serve the rights of women. 3- The need of holding intensive activities that affect the customs, traditions and misconceptions that are considered the main reason for discrimination against women. 4- The important of combating all forms of discrimination against women. 5- The need to continue providing free legal aid services to vulnerable women. 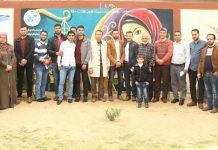 Previous articleA high-level delegation from the Office of High Commissioner for Human Rights (OHCHR) visited the headquarter of the National Society for Democracy and Law to have a look around the humanitarian situation in Rafah city.